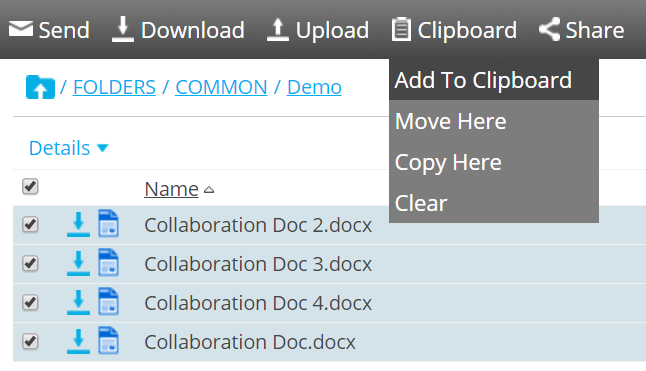 To move or copy files or folders within Thru Web, use the Clipboard tool. 1. Navigate to the folder where the file or folder that you want to move or copy is located. 2. Select the checkbox next to the files and/or folders. 3. Click on Clipboard and select Add to Clipboard. 4. Navigate to the folder where you wish to move or copy the selected items. 5. Select the Clipboard drop down menu. 6. Select Move Here. This will move the file from the original folder to the folder in which you currently you are. 7. Select Copy Here. This will copy the file from the original folder to the folder in which you currently you are. You can cancel the move or copy of the folders or files by selecting Clear from the Clipboard menu. This will leave the file back in its original location and remove it from the clipboard. Copied files are considered new and storage is added to the site statistics. If a file is versioned, copy of the current version is created. In Thru’s Audit a file copy is recorded as Upload operation with fields NextPath and PreviousPath showing source and destination folders.